Cutting edge – may refer to ‘State of the art’, the highest level of development, as of a device, technique, or scientific field… the real cutting edge ‘Abrasive’ when used as an Adjective would mean : 1) tending to rub or graze the skin 2) harsh, showing little concern for the feelings of others. Every skill needs to be honed … honing is the finishing process where the burrs formed from the sharpening process are removed and a sharpened knife is finished to a fine edge. 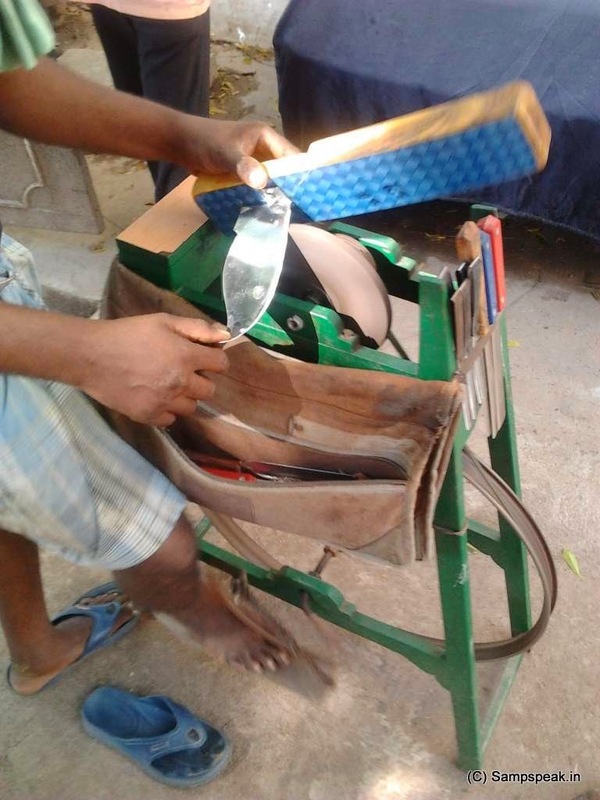 Honing is also used to maintain the edge in-between sharpening. Honing does not actually sharpen a knife. Instead, honing straightens, cleans, and polishes the edge of an already sharp knife. The smaller the angle between the blade and stone, the sharper the knife will be, but the less side force is needed to bend the edge over or chip it off. 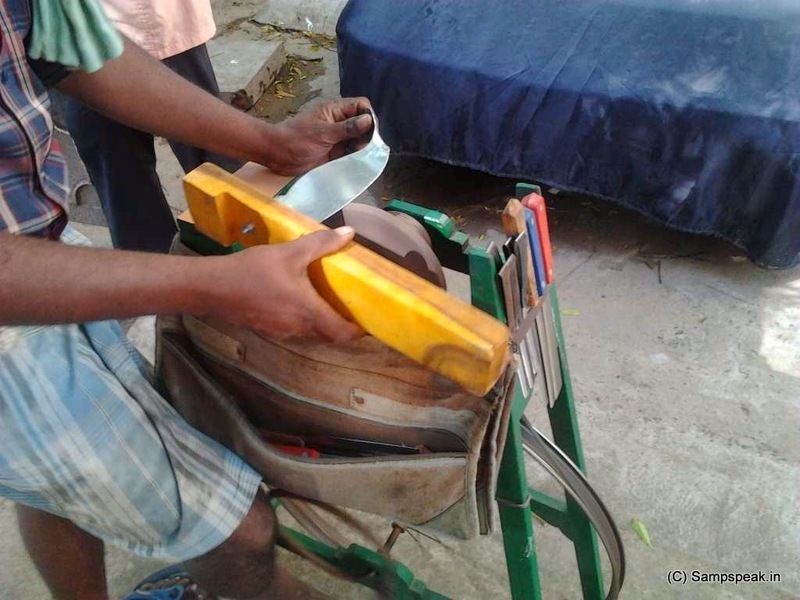 Middle aged people will remember that till a few years ago, on the streets of Chennai (and elsewhere too) pedlars would come shouting ‘saanai’ (sharpening !) 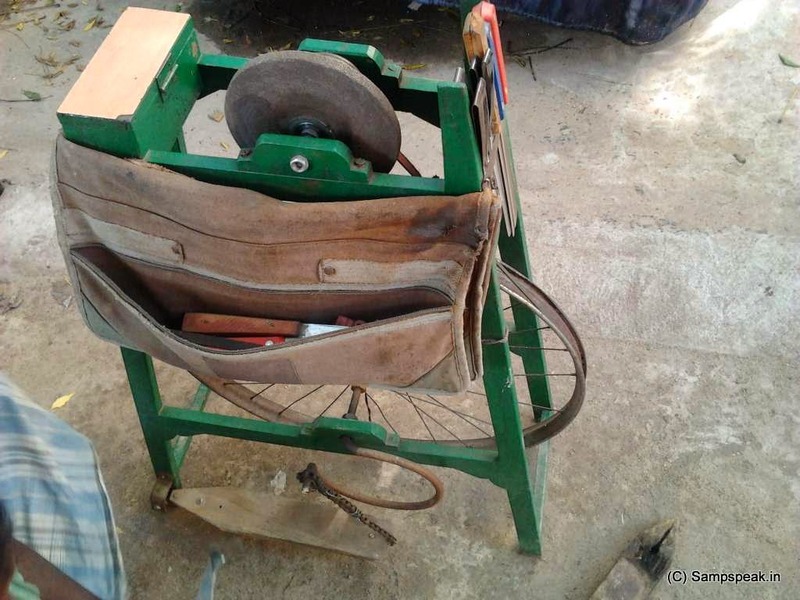 – a peculiar contraption of a wooden case, a cycle wheel, a sharpening abrasive and more …. 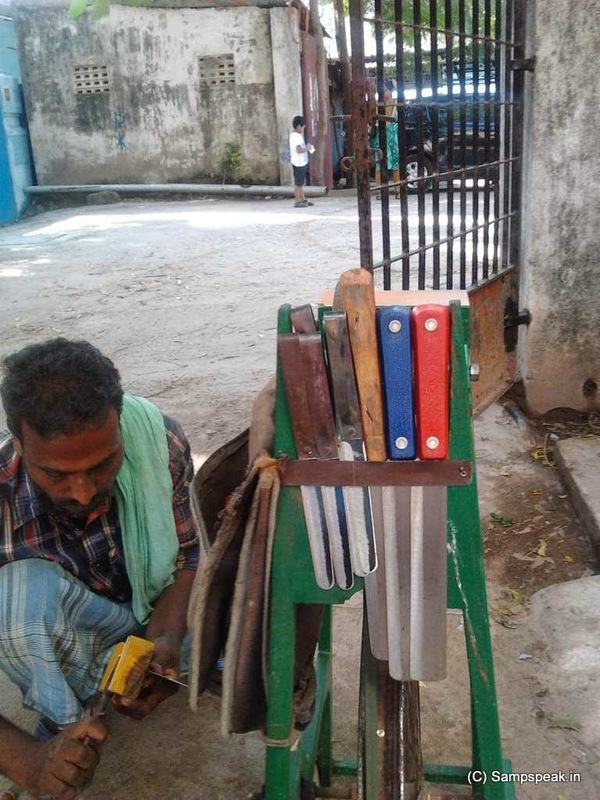 Not sure whether you spot them still – or in tune with the modern times of ‘throwaways’ … perhaps people are changing kitchen knives (aruvalmanai – the contraption used in Tamil Nadu for cutting vegetables and the like !) and other sharp tools …. Diamond, as one would know is a common abrasive. Even softer minerals like calcium carbonate are used as abrasives, such as "polishing agents" in toothpaste. An abrasive is a material, often a mineral, that is used to shape or finish a workpiece through rubbing which leads to part of the workpiece being worn away. Abrasives are extremely commonplace and are used very extensively in a wide variety of industrial, domestic, and technological applications. Common uses for abrasives include grinding, polishing, buffing, honing, cutting, drilling, sharpening, lapping, and sanding. Abrasives generally rely upon a difference in hardness between the abrasive and the material being worked upon, the abrasive being the harder of the two substances. A bonded abrasive is composed of an abrasive material contained within a matrix, although very fine aluminium oxide abrasive may comprise sintered material. This matrix is called a binder and is often a clay, a resin, a glass or a rubber. This mixture of binder and abrasive is typically shaped into blocks, sticks, or wheels. Grinding wheels are cylinders that are rotated at high speed. The one I had written about in earlier para is worked with a foot pedal – in industrial processes there could be electric motors driving the wheel too. There are very huge sized grinding wheels, depending upon the usage. Such wheels need to be constructed to withstand greater radial stress to prevent the wheel flying apart as it spins. 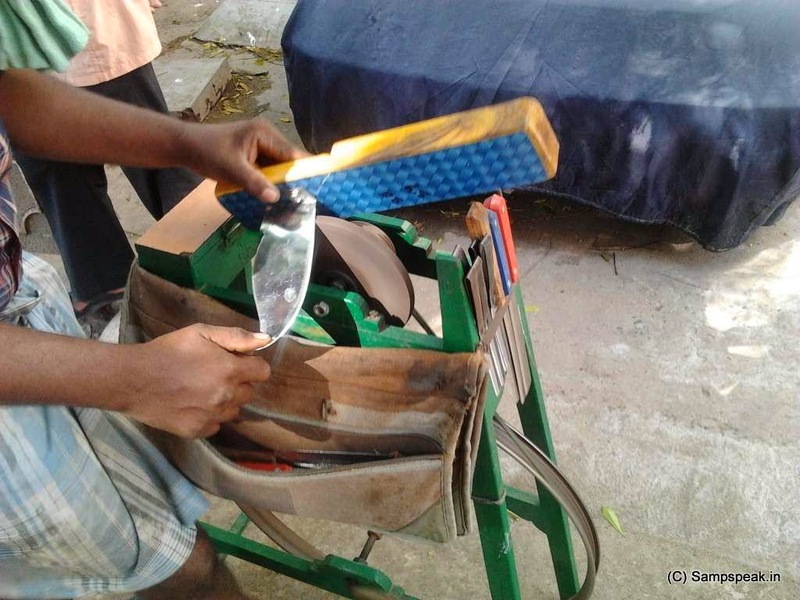 While the man on streets doing ‘saanai’ – the professional sharpener may not attract people, unless there is a need for sharpening the knife or aruvalmanai at home, I have always been fascinated by this contraption – for this industry was my first job. 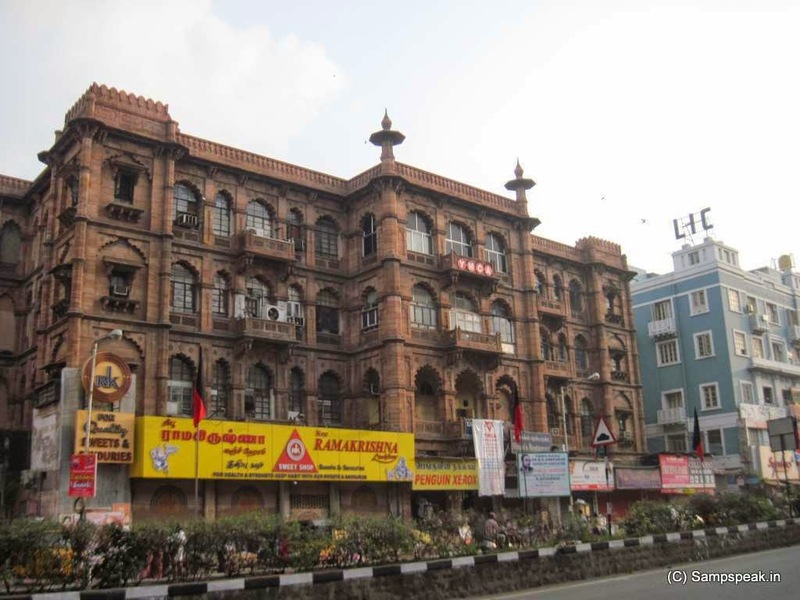 In the Parrys Corner, opposite to Madras High Court and nearer the (once) famous Ramakrishna Sweets, is a small lane – Francis Joseph Street. 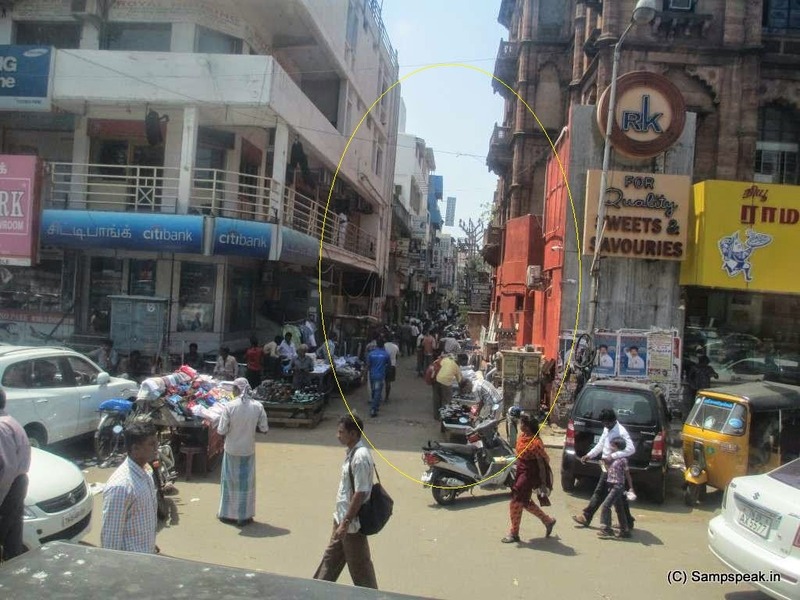 My first job immediately finishing graduation was in that lane in a Company (R. Subbaraman & Co, No. 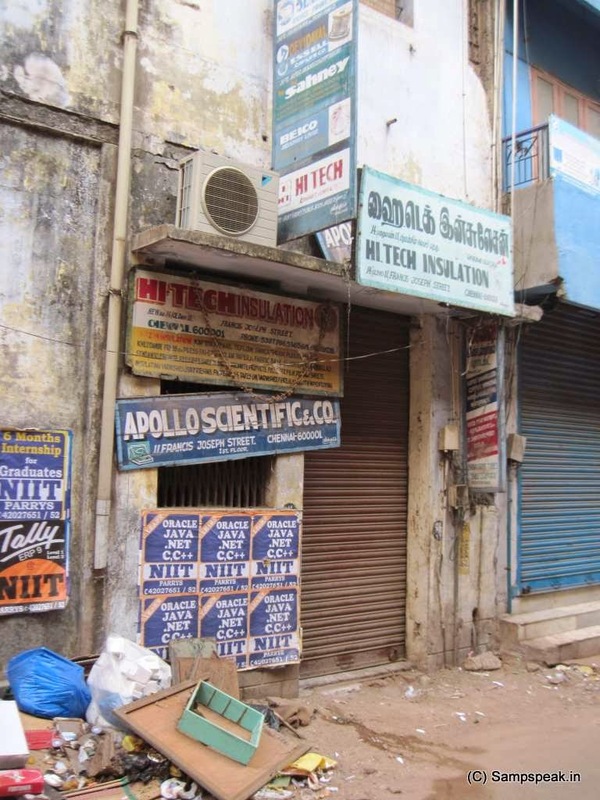 11 of Francis Joseph St) – sole selling Agents for Cutfast Bonded Abrasives – which factory was in Pallikaranai, manufacturing bonded abrasives – wheels and more in big sizes. Understand that Cutfast at some point of time was taken over by Carborundum Universal Manufacturing. My boss was extremely inspiring person (Mr Subramanian, tall and classy moustached man, who had worked as a Forest Range Officer) … though small – everything was impressive about that Office – I was so fascinated working in that Office – albeit briefly (May to Dec 1984) before embarking on a career in General insurance in Oriental Insurance. No. 11 Francis Joseph Street. Rovio's Angry Birds .... are you addicted ?? stray dogs menace ...... and cynophobia.. !! Samburu lion killer is killed by pack of hyenas !